I see a lot of benefit to block-based editors. Some of my favorite editors that I use every day, Notion and Dropbox Paper, are block-based in their own ways and I find it effective. In the CMS context, even moreso. Add the fact that these aren't just souped-up text blocks, but can be anything! Every block is it's own little configurable world, outputting anything it needs to. 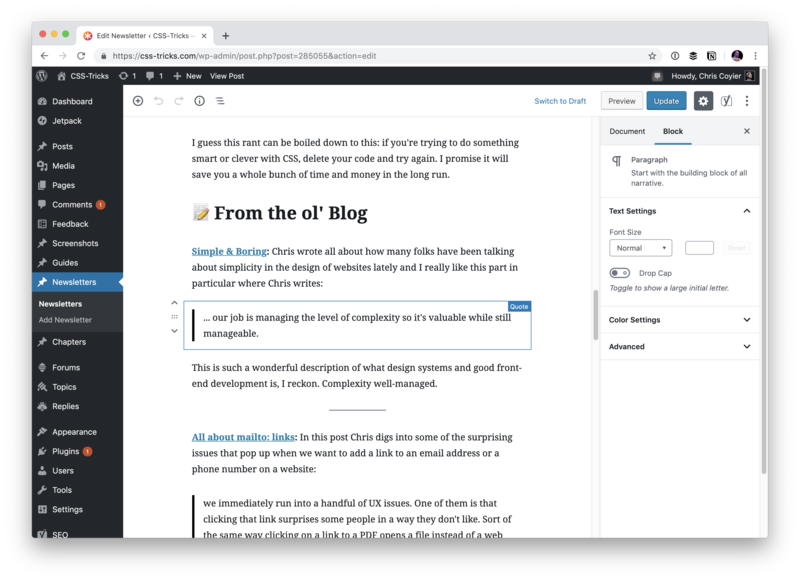 I'm using Gutenberg on a number of sites, including my personal site and my rambling email site, where the content is pretty basic. On a decade+ old website like CSS-Tricks though, we need to baby step it. 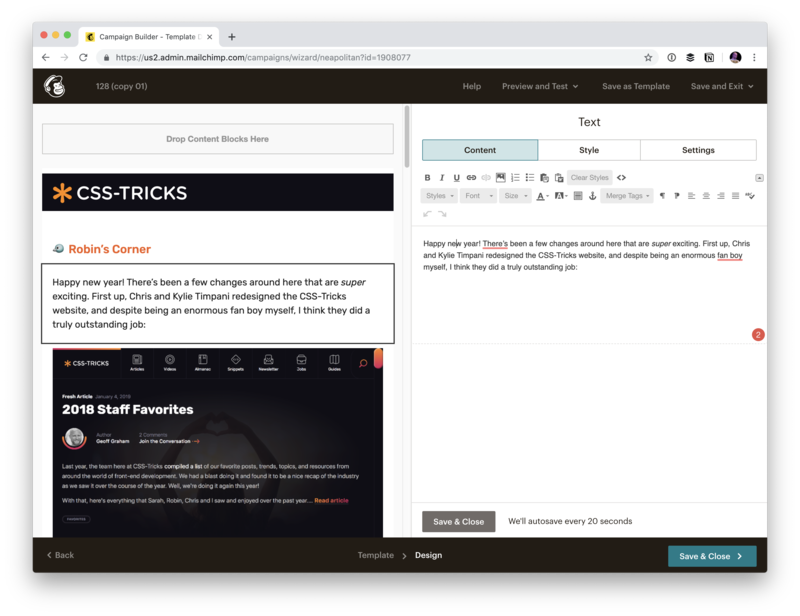 One of our first steps was moving our newsletter authoring into a Gutenberg setup. Here's how we're doing that. We already have 100+ newsletters in there, so I was hoping to only flip on Gutenberg over a certain date or ID, but I haven't quite gotten there yet. I did open an issue. Nothing terrible about that, I just much prefer when we keep the clean, authored content in our own database. Even the old way, we ultimately did get it into our database, but we did it in a rather janky way. 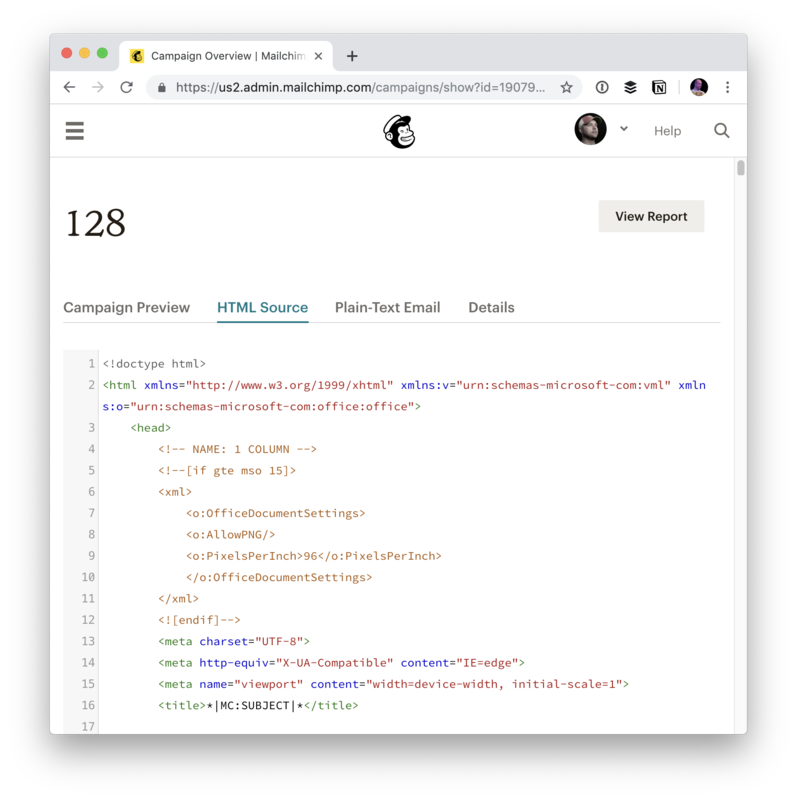 After sending out the email, we'd take the HTML output from MailChimp and copy-paste dump it into our Newsletter Custom Post Type. That's good in a way: we have the content! But the content is so junked up we can basically never do anything with it other than display it in an <iframe> as the content is 100% bundled up in HTML email gibberish. 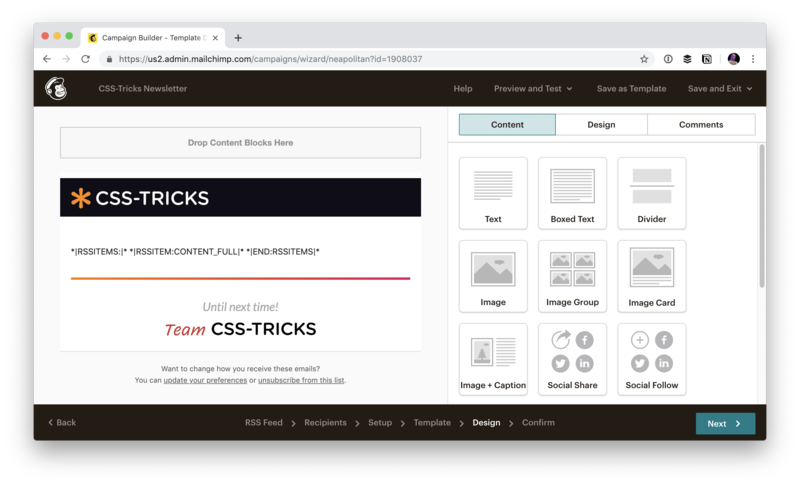 I'd argue that the writing experience here is similar (MailChimp is kind of a block editor too), but nicer than doing it directly in MailChimp. 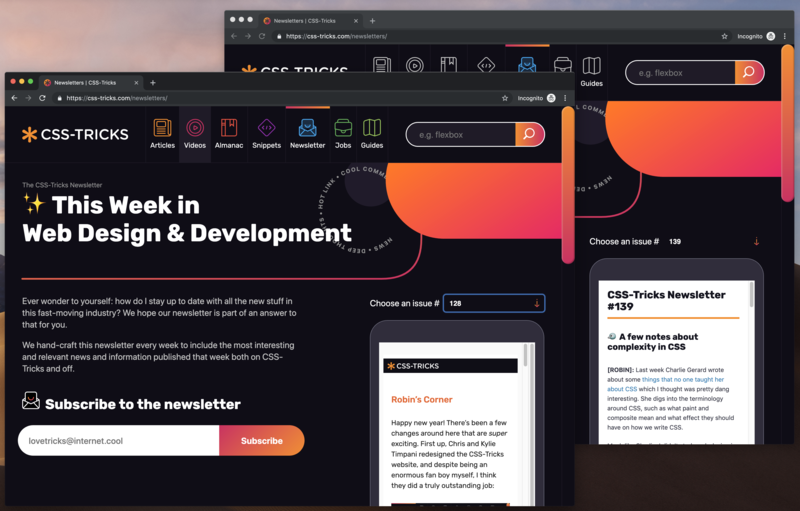 It's so fast to make headers, lists, blockquotes, separators, drag and drop images... blocks that are the staple of our newsletter. I like having a permanent URL for each edition of the newsletter. I like that the delivery mechanism is email primarily, but ultimately these are written words that I'd like to be a part of the site. That means if people don't like email, they can still read it. There is SEO value. I can link to them as needed. It just feels right for a site like ours that is a publication. 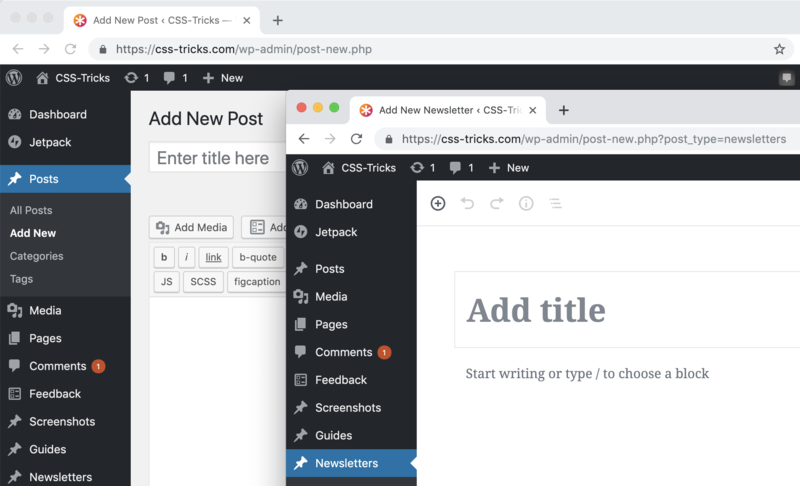 Now that we're authoring right on the site, I can output <?php the_content() ?> in a WordPress loop just like any other post or page and get clean output. Old and new newsletters display equally well, it's just the old newsletters need to be iframed and I don't have as much design control. Since we aren't creating the newsletters inside MailChimp anymore, did we have to find another way to send them out? Nope! MailChimp can send out a newsletter based on an RSS feed. 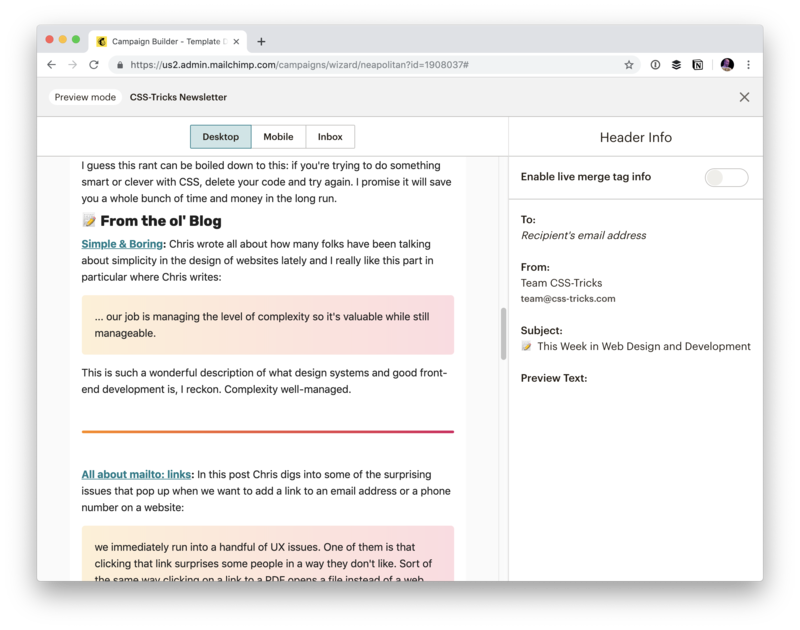 But... for us, I wanted to make sure that any of those old HTML dump emails never ended up in this RSS feed, so that the new MailChimp RSS feed would never see them an accidentally send them. So I ended up making a special Page Template that outputs a custom RSS feed. I figured that would give us ultimate control over it if we ever need it for even more things. And then you can style that by injecting a <style> block into the editor area yourself. 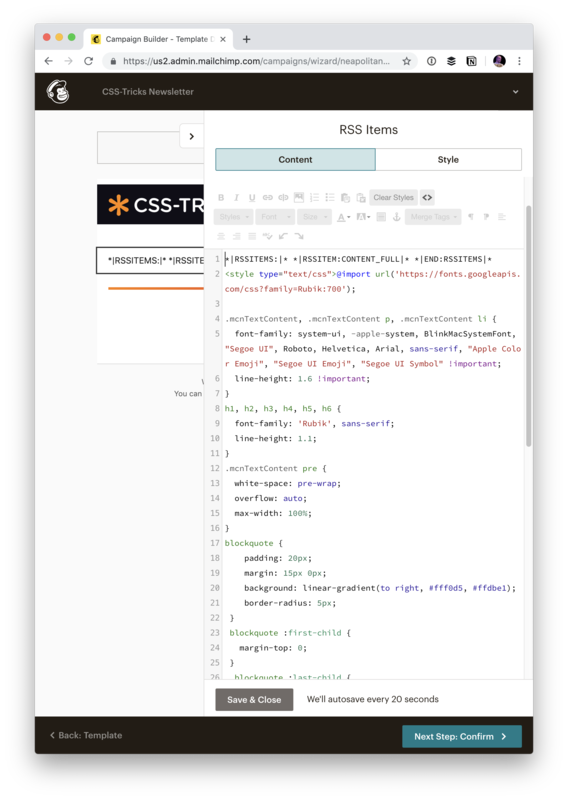 That gives us all the design control we need over the email, and it's nicely independent of how we might choose to style it on the site itself. I’ve been looking at ways to improve the way that I do our weekly newsletter. I had always thought about building the RSS feed out of a series of links (our newsletter is more of a weekly roundup of links) that would be pulled into Mailchimp, but the elegance of just adding them all to a single post…. the simplicity must have tricked me. Ta for the new approach, I might just have to borrow it. Well, at least somebody is having fun with Gutenberg, while the rest of us tend to prefer robust tools like ACF and NO Gutenberg (even using a different flavour of WordPress), and the others like to use fragile tools WITH Gutenberg .. and bash each others head in because of that.